The IALP 2010 conference will be held in the Modern Hotel Harbin (Madie'er Hotel). 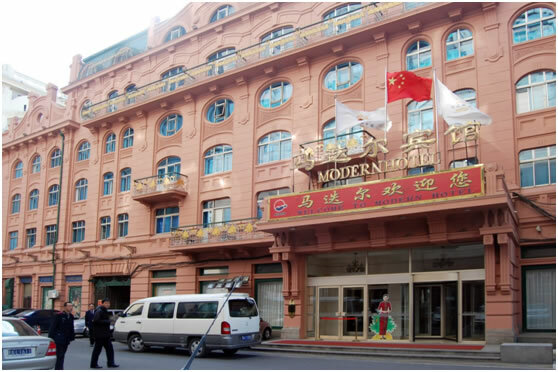 The Modern Hotel is a four-star hotel and a member of China Friendship Hotel Group. Established in 1906, the hotel incorporates architecture typical of the French Renaissance period under King Louis XIV. The Modern Hotel is located on the famous Zhongyang Street, adjacent to Zhaolin Park where one of Harbin's most celebrated events, the "Ice Lantern Show" is held every winter. The Modern Hotel, with the scenic Songhuajiang River just to the north, has a pretty surroundings as well as convenient access to local transportation. It resides at the local center for culture, recreation and business in Harbin. With a hundred year old history, the Modern Hotel is embedded with deep cultural heritage. It witnissed many historical events and historical figures. Lots of celebrities left their footrpints here. Among them, there were Ching-Ling Soong (Madame Yat-sen Sun, a former Vice president of the People's Republic of China), Moruo Guo (one of the leading writers in 20th-century of China), Jishen Li (a former vice president of the People's Republic of China). Being in a luxurious and elegant architectural style, the hotel is steeped in novelty and elegance, but is also home to a lively, modern atmosphere. The Hotel has 141 guest rooms, with standard rooms, single rooms, deluxe suites, duplex suites. A wide variety of Chinese and Western restaurants can accommodate 480 people at the same time. The hotel is also attached with Russian flavor ice-cream parlor, shopping malls, bars, beauty salon, multi-purpose hall, swimming pool, tennis courts, KTV rooms, taxi companies, travel agencies, hotel management companies, business center and so on. It is an ideal place for dining, business meeting, shopping, and entertainment. Though there are possible other choices, we strongly recommend the conference delegates to stay at the conference hotel. This is one of the best hotels with moderate prices. The conference has negotiated with the Modern Hotel Harbin to reserve a block of 35 rooms with a good conference rate. Important: Please kindly note that it is difficult to book hotel at Harbin during Ice and Snow Festival from later December to Febrary of next year. Therefore, we strongly suggest you to make your reservation as early as possible since the rate will increase greatly when it is close to the Festival dates. 1 US Dollar (USD) = 6.5 Chinese Yuan (CNY, RMB) as of Nov 10, 2010. The room rate is inclusive of buffet breakfast, in-room internet and all taxes. The standard room can accommadate 1 or 2 persons. To reserve a room, please download and fill in the reservation form, and send it to Ms. Lili Quan by e-mail at qll326@yahoo.cn. If you need to change or cancel your reservation, please contact Ms. Lili Quan as soon as possible and not later than Dec 19. After that date, you will have to pay one night hotel fee as the cancellation charge to Modern Hotel Harbin. (1) Taxi: Taxi fare is around 10 RMB and it takes around 10 minutes, depending on the traffic. (2) Bus: Take bus No. 101, 103, 102 or 16, and alight at Seventh Street, which is around 100m away from the hotel. (1) Conference pickup: The conference will pick up the delegates from Harbin airport to Modern Hotel Harbin on Dec. 27. (2) Taxi: Taxi fare is about 130 RMB and it takes around 50 minutes, depending on the traffic. (3) Airport bus: The fare of airport bus is 20 RMB. You can take airport bus to the train station, then follow the previous instructions from train station to hotel.